This topic contains 4 replies, has 3 voices, and was last updated by NadeemAhmed 2 years, 2 months ago. I have a serious problem with Windows Update on Surface RT. It makes me a headache for a few days until I figure out how to fix it! 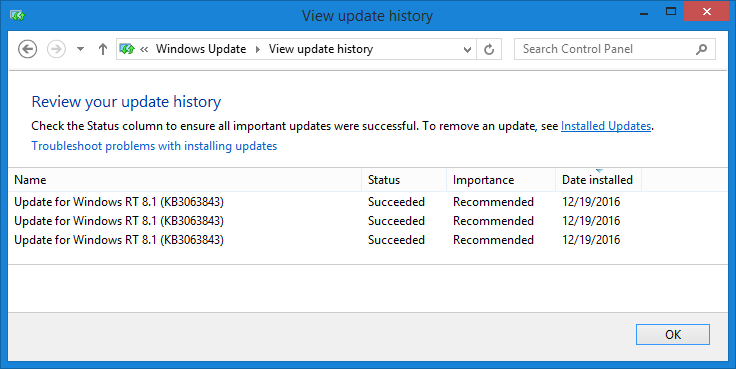 1 – On the Windows update page, it keeps Checking for updates endlessly. 2 – On Task Manager, the Service Host: Local System always uses a full CPU’s core usage around 25%. (It do affect my device performance and battery life). 2 – Troubleshoot with Windows Update Troubleshooting available on Control Panel and from Microsoft Website. 3 – Reset my Surface RT 3 times. 5 – Try to update with Local Account and Microsoft Account. All of my tried still can not fix my problems. 3 – Check for updates again! Now It Work! and no more CPU usages problems! I think, I have missed about DNS problems that might a root cause of my problems. I hope it will help you guys that has problems like me. Sorry guys! I think it fixed my problems but it’s not! I have tried to reset my Surface RT once again to see if the problems can be solve or not. This time windows update just loop in checking and installing the KB3063843 updates. I think Microsoft might working on this problems by blocking further windows updates that will cause high processor usage and can’t download apps from Windows Store. If you don't have an account on our forums, you can use this comments section to share your issues, solutions, or any ideas related to the “Surface RT Windows Update stuck at Checking for updates” topic.